Busby (Buzz-Bee) Junk Removal Seattle offers trash removal and junk disposal services in Seattle for both residential and commercial customers. Our Seattle rubbish removal and junk removal services include two junk haulers, our junk trucks and equipment to haul your junk. We can remove your garbage, trash, old furniture, old appliances, e-waste, yard waste, dirt, rockery, construction debris and renovation debris. Call Busby Junk Removal 1-877-404-5865 or click to book online. Our junk hauling service is based on how quickly and efficiently we can recycle materials. Here are our top 4 junk removal tips on how you and Busby Junk Removal can save money. Haul away junk all at once: When you let us remove trash in bulk we save time and diesel. This allows our company to extend these saving to you by giving trash volume discounts, so the more junk you have the more you save. Combine with someone for trash collection: Get together with your neighbors and have your junk removed at the same time, this follows the same princible as before, the more junk volume you have the more you save. Flatten any junk you can: Break down the old junk items so they can fit flatter in the truck. Cardboard boxes, tables and other trash can be broken down into flatter pieces that will fit better in our trash truck. Maximize the garbage services you already pay for: stuff your trash can and other recycling bins with as much as you can, that way you don't have to use a secondary trash removal service. Trash Removal Service Area: King County, Snohomish County and Northern Pierce County. The main focus area for our junk removal service is the Eastside and Greater Seattle. We travel as far south as Tacoma, north to Everett, east to North Bend and west to Seattle. 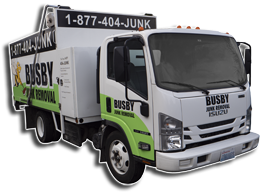 Busby Junk Removal Home Location: We operate from the Eastside in Bellevue WA. We began offering our junk hauling service from the Sammamish Plateau in Issaquah WA. Click for more about Busby Junk Removal. Junk Materials Accepted: List of the acceptable junk removal items for our junk pick up service. Definition and History: Quick overview of junk removal and junk pick up industry. Washington Recycling Resources: Recycling junk in Washington. to Make Your Life Easier!